The History and Art have been a fascinating but paramount part of human life and traveling raised a deliberating arm to connect these two. Places are stories of the past, of lives one lived and the carvings show their struggle, their experience in the lives these stories existed. We live today in a time of crisis and that’s where the philosophy of these roads attracts the crowd to set free into the certainty once existed to find oneself in the reality we are. India is the land of one such reality, one such subtlety where the past still lingers into the ar ms of cities strayed during the day and bewildered in the nights to find the peace in the chaos doesn’t last forever. Under the feet of mountains there is one silver lining leads to the gateways, abandoned by the cold breeze in the adolescence of crying birds. When you go through the Golden triangle of India tour, the world surprisingly closes into those mere places you have never seen before. The art dances underneath the stones of vivid architecture. The tradition mold the places into the veil of blushing skies garnished with the stroke of sunlight. 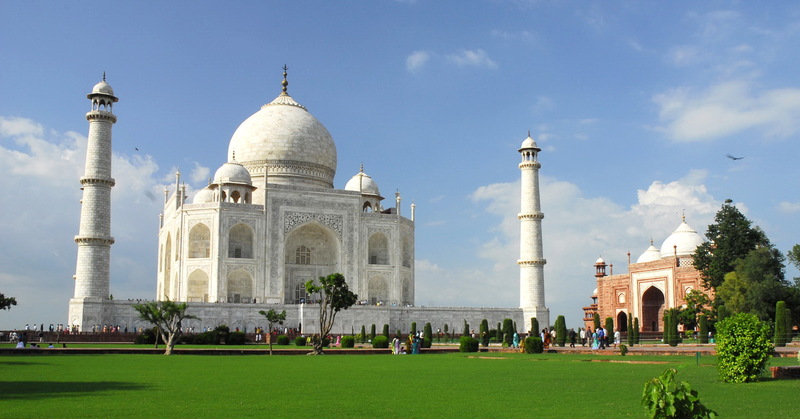 The Golden Triangle is a tourist paradise where it is called as it is because the whole map connects the capital of India, New Delhi, Agra and Jaipur. These are the places blessed and propounded as the tourist sites, celebrated and enormously beautiful in the unchanging state of ease and vivacity of one’s eyes. Into its physical existence this Golden triangle covers so many precious aspects of life and aesthetic. Taking a tour of a few amongst them here is list of expedition, one must visit to these corners and strands. 1. Red Fort (Agra): History leaves the mark on the bricks of human life and sometimes defines the whole city with one site. Red fort situated in the heart of the city of Agra. It is one of the UNESCO World Heritage sites and also known as Lal Qila, Fort Rouge and Red Fort of Agra. Stepping into the great history and a sacrificed mourn built in the red walls of this fort makes it the most visiting and fascinating consign across the whole country. In the lore of his consolidated life the great king Akbar got built this red monument and till date it sings the aromas of that Golden Era. 2. Sikandra Fort: A harmony in the small town called Sikandra near Agra is the place where the Tomb of great Mughal Emperor stands, known as Sikandra Fort. The most exquisite and intricate place to visit. Akbar’s Tomb is an immense example of medieval architecture with a fusion of remarkable representation of Hindu and Islamic ethics. In the midst of beautiful garden and several water cascades this place is divine and holy in the middle of gone tomorrow. 3. Taj Mahal: A treasure given to the Indian land and culture. A transition from a long period exhaling the great stories of the past, Taj Mahal, one of the eight wonders of the world is located on the riverside of the river Yamuna as a white crown in the city of Agra. Representing the devotion and clarity of the love Taj Mahal is a melancholy of Shah Jahan on behalf of his beautiful wife Mumtaj Mahal. This white marbled monument is a reward from the history of India which took away the breaths of each eye pictured it. Inside it is the Tomb of his beloved wife with the astonished carvings on the walls, jeweled by expensive gems and stones embedded on it. One for a lifetime Taj Mahal is the center of attraction and memoir of love in the account of the World. 4. Fatehpur Sikri: Mughal Empire led a high impact in the past as well present of India. And again Agra is the center of almost all great monuments build during that time. Fatehpur Sikri the city of Victory has a great history marked by the several attachments in it. The Buland Darwaza is an embellished mark and a face of attraction to all of them who witness the vastness of what has left behind from the snippets of the past. 5. City Palace: Rajasthan, a cliff of grains romanticized in the benchmarks of History, a place where glories still exist under the drought of sacrifice and peculiarity. That’s where the City Palace of Udaipur located. Built by the rulers of Mewar Dynasty, this ascetic palace is located in the midst of forests and the Aravali mountains of Rjasthan. The Royal scent still lingers in the rooms and blooms of this palace where amateurs visit to be mortal again in the awe of its beauty and serenity. 6. Amer Fort: In the midst of the pink city of Rjasthan; Jaipur, Amer fort is located. Guarded by a hill around this fort is the center of attraction in the small town of Amer, Jaipur. Embellished by the Rajputanas this fort has seen the centuries of red and blue eras back at that time. Where the royal blood proudly protected the aesthetics and fought for the lives of thousands with the blink of an eye. 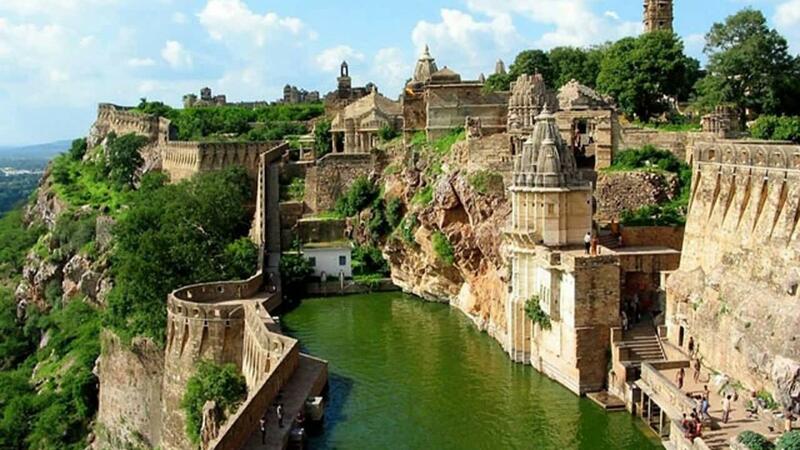 Into the vastness of architectural dividend this fort is divided into various courtyards and assembles with a great life of Kings of Rjasthan. 7. Hawa Mahal: The Palace of Breeze, located in the city of Jaipur into the colors dunes of Rajasthan. Back at that time when Royal females strictly followed the Pardah system the construction of Hawa Mahal began to let them enjoy the views and outside world through the fleshed windows. The architecture of this building is devoted to the great Lord Krishna as it is in the shape of his crown, shows a devotion and beauty in the sanity of desires. 8. Jal Mahal: It is a water palace situated in the man sagar lake of jaipur city in Rajasthan. Jal Mahal is a five storied building and built with sandstone. From five floors four floors are in under water and the rest floor is exposed. It posses fresh water and surrounding with lake area. During evening it seems very beautiful and attract the visitors due to it’s natural beauty. 9. Birla Temple: Refers to the Hindu Temples, is a magnificent place for Hindus to worship and pray. Built in the spray of white marble or sandstones there temples are located all over the country, for the Hindu religion to be profound. Birla Temple is Famous by its divinity and architecture these temples are stunning places for one tourist to visit across the country. 10. Nahargarh Fort: Located on the edge of Aravali Hills, this fort takes the breathes away from all the visitors with its exceptional location and architecture. It is a strong and a defending ring around the city of Nahargarh, once in history, it proved its strength and protected the city from the war zones. Nahargarh Fort is Famous as a hunting palace of the Maharajas, this palace is waving a strong history and glory of a lifetime. The world is a fascinating place and India ranks amongst the top whether it’s up above the hills or deep down the rivers. With the gone astonishments to the existing marvels, come and take a tour with Japji Travel of the country’s exceptional fragrances of the past and dwell into the mirrors of bravery and exquisiteness. All visitors want for an amazing trip but they don’t get because first time, it is n’t possible to know about that travel company. But at japjitravel.com you make sure that your trip across india is rememberable and amazed. We always focus on best quality service that’s why visitors give our reference to others. Japji Travel never demand a big amount of money to you as compare to other travels. We have a discount price in maximum times over a year. Also there is a multiple payment option. This entry was posted in Tourist Attractions and tagged famous attractions in golden triangle india, golden triangle places, places in golden triangle. Bookmark the permalink.